When my daughter was diagnosed with severe asthma and was hospitalized in critical care several times in just a few months it became my mission to create as healthy an environment as possible for her. My pediatrician strongly recommended an air purifier and it was on my “to do” list which seemed surprisingly long so it was pushed to the back burner as I tackled my list. Looking back, I am now sorry that I waited to bring an air purifier into our home. We recently had the pleasure of trying a Therapure® 201 MB Air Purifier and my husband and I have been extremely impressed. The Therapure® 201 MB Air Purifier is sleek so it does not take up a lot of valuable space and removes smoke, dust and pollen from the room. I am thrilled about the pollen removing ability of this air purifier because my daughter is highly allergic to pollen from many of the trees and grasses native to Florida. In my opinion, the best feature is the UV Lamp which “kills harmful airborne germs, bacteria and viruses.” Since a simple virus can be life threatening to my daughter in mere hours this is an invaluable addition to the Therapure® 201 MB Air Purifier. The machine itself is not loud at all and has adjustable fan speeds including low, medium or high. You can also turn “on” or “off” the UV feature too. 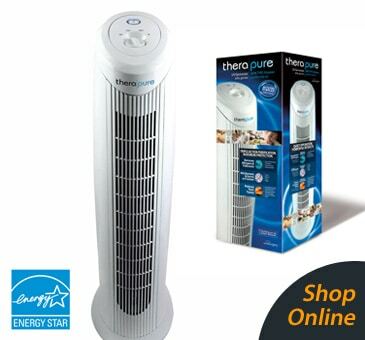 I also appreciate that theTherapure® 201 MB Air Purifier has earned the Energy Star by meeting US EPA standards. As if it can’t get any better there are no filters that I have to remember to replace as it has a permanent and easy to clean HEPA type filter. This air purifier has the capability to clean a large room of up to 13×14 ft. My husband was really impressed (difficult to do) and actually suggested getting the smaller model for the kid’s bedroom and playroom and another for our bedroom. Need to clean a different size room? Therapure® has different models available to clean rooms large or small and you can view the entire collection. The Therapure® website has a lot of valuable and interesting information about the science and technology behind their products. You are invited to visit Therapure® to learn more or to purchase their products. Have you heard of SAFETOUCH™ insulation? Neither had I until recently and it really got my attention because we had just been crawling in our attic to bring down Christmas decorations and I was sneezing and itching from the fiberglass insulation that is currently installed. SAFETOUCH™ insulation by Dow does not have any fiberglass shards and is the new “friendlier” way to insulate your home. Though I haven’t tried it myself, I wouldn’t hesitate to use this product if I were remodeling to building a new home. You can learn all about SAFETOUCH™ insulation and its benefits by reading about how it can improve your indoor air quality. It does not support mold growth nor does it contain added formaldehyde. Hmmm….now I think I really need to talk to my husband about replacing our current insulation! Their HEPA filters never need replacing. I like the Safetouch insulation because it contains no added formaldehyde, borates, or fiberglass. It will be a much safer option to use in my home, because myh husband has severe allergies. I like that the Therapure never needs a filter replacement & uses the same UV & germicidal tech that hospitals use. I have your Winter Follower button posted in my left sidebar under special blog events. thanks! I like that it also removes toxic fumes. I’ve never heard of an air filter that could do that. Thanks. I like Simply Stacie on FB! I follow with GFC! thanks for the bonus entry! http://grammymousetails.blogspot.com/2009/05/cheese-roll.html thanks for hosting a great giveaway! I love that safetouch feels like fluffy cotton balls! Thanks! I like the Ginger Lemon Peel Herbal Water on the store. I love that the filters do not require replacing. I tend to open windows but that just brings in so much dust. This would be so awesome! I like that you don’t have to replace the filters. I like the Black Tea Bundle by Cha Cha Tea from your OpenSky store. I like that the safetouch insulation does not contain fiberglass.